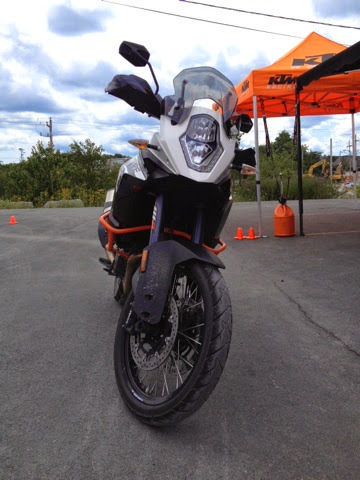 Friday afternoon and it's KTM demo day at Freedom cycle in Halifax- near my home base. 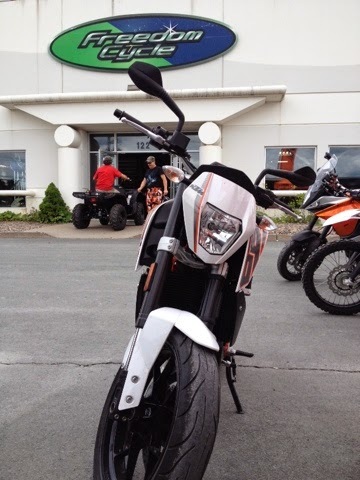 It's a factory supported tour with the bikes sporting Quebec plates. Everything new is here but the highest profile and rare bikes got booked up fast- namely the RC8 and the 1290 Super Duke. Shame I didn't get to ride either of those but I sat on the RC8 and oh boy that's one hard seat! Zero cushion! It's pretty much instantly uncomfortable. 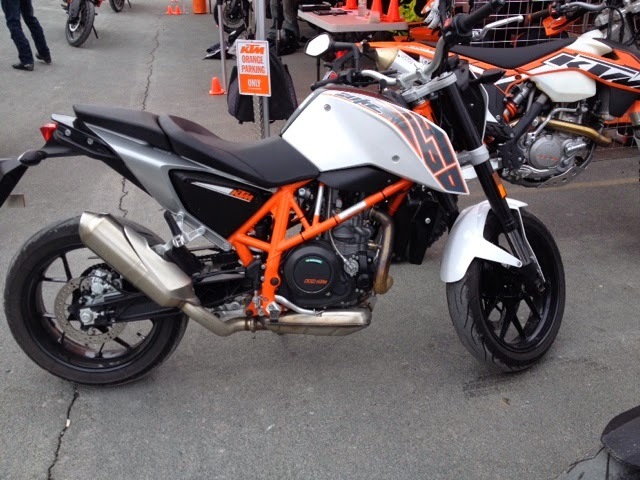 The 1290 Super Duke looks fantastic and from all reports it rides as nice as it looks. Wind blast on the highway might be an issue but this is a naked bike so that's to be expected. I'd hazard a guess that the hardest part about riding the Super Duke might be keeping your licence- you're going to have a target on your back riding that beast! It looks fast even sitting still. My first ride was the 690 Duke. The ride guide said to make sure you adjust your mirrors as we sat on the bikes so the first thing I noticed is the mirrors are pretty much useless. They're too low and too small to see much if anything in but they do look nice! 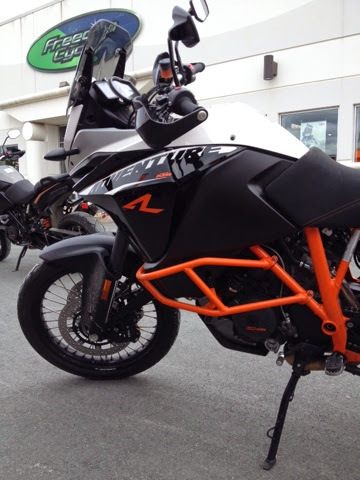 The second thing I noticed is the 690 Duke is small, compact, and light weight. It's almost as if you're on a big bicycle - only this big single has about 67HP and can travel at highway speeds with ease. Even in top gear at 110 KM/hr when you crank your right hand it still pulls with authority and feels like it's got plenty to give. Being that it was a tightly controlled demo ride I couldn't really test the upper limits there. The seat is deeply sculpted which is very comfortable but doesn't allow you to move around too much. You've got a little bit of space but not much. The shape is good though and doesn't push you onto the tank like many seats seem to do. I'm not really accustomed to riding a single so it felt rough to me with vibrations making their way through the seat, pegs, and handlebars. Up over 3000-4000 RPM and it seemed to smooth out. This bike would make a GREAT commuter bike. It's light, and super nimble while still being very capable at any speed. It's not going to feel like overkill riding it around town but will have no troubles on the highway either. There's lots of torque and it's pretty fun to ride. The clutch is incredibly light - the lightest of any bike I've ridden I'd say but each of the KTM's I rode on the demo had that same trait. The gearbox is smooth with no clunkiness. Shifts are silky smooth. The brakes are excellent as well. Great stopping power and it comes with ABS too. The only negatives for me were the vibrations - but it is a single so that's to be expected to a degree and this is a very powerful single at that. The seat ergo's are a bit tight. It would be a bit cramped if you had any great distance to travel. What do I like - this list is a little longer than the negatives. - Great power from that single! - Fun factor: You feel like you're riding something really small because you are! This bike is only 330lbs without fuel. That smallness belies its capabilities. The power is instant and a little more exciting in its delivery than say a similar sized parallel or v-twin. - ABS: A great safety feature that will make your commute that much safer. I think this is a bike you'd enjoy more and more as you rode it. It's got character to spare and is a sharp looking bike. This is one tall bike! Unloaded, the seat is 35 inches (890 mm). With my 32" inseam I needed to climb on the left peg to get a leg over. Once the suspension squatted when I sat on it I could touch on my tip toes. Center of balance is low and once underway any concerns about seat height fade away - at least on a pavement ride. You'd need more skill than I have to handle this bike off-road with a 32" inseam. No doubt it would eat up fire roads with ease and far worse with the right rider at the controls. Even with its height and massively powerful 1190 engine this bike tips the scales at a measly 478lbs (217 KG) without fuel. When I say massively powerful I mean it - The 1190 produces 148 HP. Cycle World Dyno tests put rear wheel horsepower at just shy of 129. The delivery of that power is so smooth and refined you'd hardly know you're accelerating and as quickly as you are and riding at the pace you're capable of on this machine. Highway speeds are a walk in the park. I kept it in 5th gear most of the time just to make it a little more interesting but it'll pull with zeal in either 5th or 6th. In 6th - a 110 KM/hr speed feels like you're barely moving. There was a bit of wind on our test ride and the 1190 R Adventure is rock solid. The windscreen is adequate and adjustable. There's different sizes available as factory aftermarket if you want something a little taller. 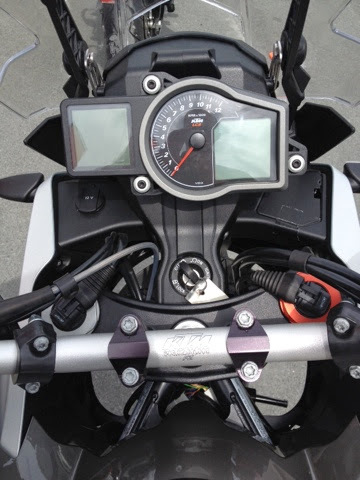 The placement of the instrument cluster is excellent on the 1190 R Adventure. It's high up and clearly visible at a glance. It looks as if it's ready to be entered in a rally. It's very visible at a glance. The gear indicator is a nice touch. There's a 12V accessory outlet at the left and a small cubby on the right. It doesn't lock and has a plastic clasp to hold it closed. I'm not sure what you'd put in there - Wouldn't want to hear anything rattle around in all that plastic. Perhaps it'd be a good spot to keep your earplugs? Not sure. Power delivery is linear. There's no twitchy delivery - the engine is smooth and power just keeps coming. I'd say it's deceptively powerful. It's not nearly as hairy as say an R1. The power is there - it's just smooth. The bike was set in Street mode which allows for the full horsepower and controlled wheel slippage. There's also Sport mode, Rain and Off-road modes (rain and off road limit horsepower), and off. The different modes have various affects on the amount of traction control intervention, rear wheel slippage, and throttle response. The bike even has lean-sensitive cornering ABS! No gripes about this bike - it's fantastic. You'll need to be tall to be confident off road on it though. It could be daunting to move around in a soft asphalt parking lot or loose gravel too. Great all-rounder! 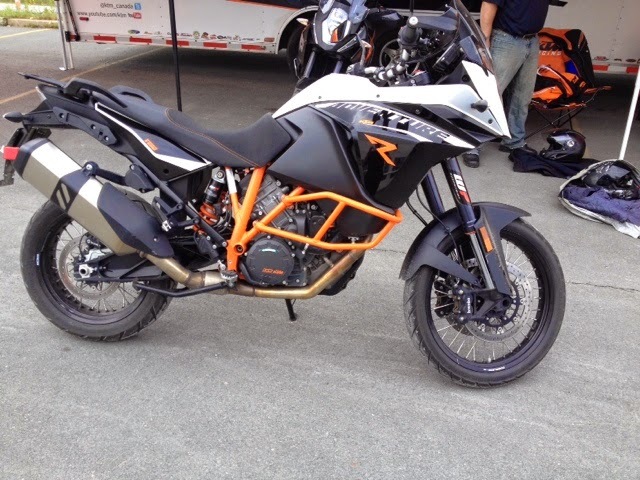 This is going to be a popular bike for KTM without a doubt. If you're in the market for a big adventure bike you need to test ride this bike first! I discovered the benefits of being on the last ride of the day on the last day of the Demo's. They've got to fuel up all those bikes! So I got to ride another bike for a short ride, not on the highway but without the strict controls of a lead rider and sweep rider. 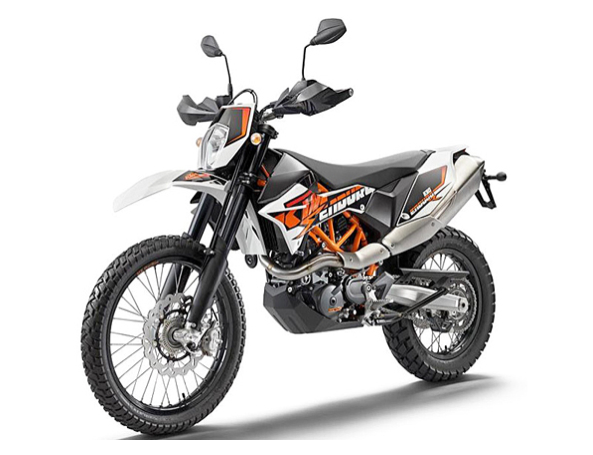 My bike of choice this time around - the 690 Enduro R. It is shockingly fun to ride! Wow! Fun, Fun, Fun! I'd take this bike over a ride at Disney any day. I didn't get out on the highway and I expect the experience wouldn't be as fun there but for around town, and secondary roads - this bike is a weapon. It's so light and the handlebars are nice and wide giving you fantastic maneuverability. If I could add one bike to my garage this dual-purpose would be it. It's heavily dirt biased - a dirt bike with a turn signals and a headlight. If you didn't need to do much highway riding and wanted a bike that would take you from home to trail with maximum fun factor - THIS is your bike. The ride was so impromptu I forgot to get pictures of it. I was too busy grinning ear-to-ear! So here's a stock photo. It has the same engine as the 690 Duke. A 67 HP single with a tall seat height of 910 mm. or 36.81in. Wet weight is 150kgs or 330.7lbs. If you have a chance - you need to ride this machine!